That baby looks so warm in the sun. We just had snow here today and I could use the sunshine. What can I say? Love, love, love your blog!! The pictures of your farm, animals, garden and wonderful receipts (drool!!) are just simply wonderful! And the picture of this little cutie pie is just so sweet as well! Keep on farming and posting!!! We live on Long Island and today is lovely compared to the last three days of snow,sleet,rain,black ice ... horrid . My two furbabies can't wait to do exactly what your little baby lamb is doing,I can almost read their minds as they look longingly at the covered chaise on deck when they go outside. Can't you just see the "ahhh" of sheer pleasure on that sweet face? 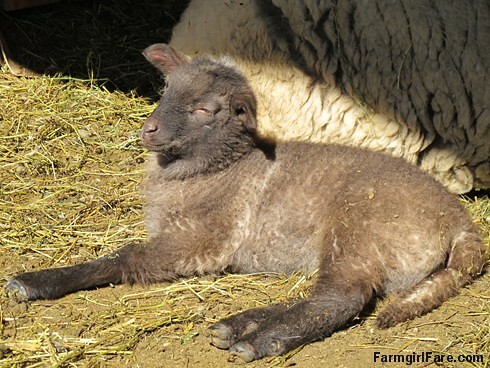 Thank you for sharing this adorable lamb with us. Sunshine, I need sunshine! We still have 2 feet of snow. I can't wait for spring and I bet that little one is looking forward to it as well! As for the comment spam... is there a decent anti-spam plugin for Blogger such as Akismet? I use Wordpress so I'm not too familiar with blogger. Blogger actually has a really good built in spam filter, but spammers have become really sneaky - leaving 'real' sounding comments - and it doesn't catch the ones left by anonymous commenters. Unfortunately Blogger also ties the option of leaving an anonymous comment together with the name/(optional)URL option, which means if I stopped allowing those, you would have to be registered with Blogger or Open ID (which I don't even know what that is) in order to leave a comment. So glad you enjoyed this photo. Thanks for your comments!